First of all, The Da Vinci Code was the first book that I read where I didn't stop for 12 hours until I finished it. I could easily do it with a 200 page novel, but a book at 500+ pages usually takes me a week to read. The fast pace of the novel just won't let down and you cant lay the book down even if you wanted to, seriously. 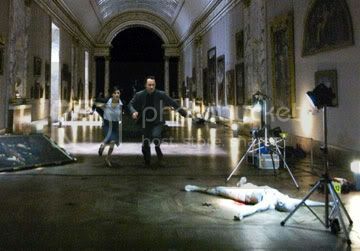 My anticipation grew for The Da Vinci Code movie. Some people have waited years for this movie to come out. When Ron Howard's Imagine Entertainment and Tom Hanks were officially attached to the film, a wall of anticipation and criticism came their way right away. Some say Tom Hanks wasn't suited for the role. Some say his brilliant acting would see it through. Some just didn't want the movie done. Although The Da Vinci Code is, after all is said and done, a guaranteed hit. The movie did not come into fruition without difficulty. Protests from the Catholic church, the Opus Dei themselves, and lawsuits from authors claiming copyright infringement hit production left and right. However, this only piqued the movie going public's interest on the movie adaptation of the already well loved novel by Dan Brown. Locally, there were pathetic last minute attempts by small groups calling the MTRCB to censor the movie completely. Which i think added fuel to the already burgeoning interest in the movie. Personally, Ithink whatever they did to stop it just guaranteed the movie 12 extra persons each theater come opening day. Robert Langdon (Tom Hanks) is a celebrated symbiologist on a tour to promote his book when police call him in to assist them with the murder of the curator of the famous Louvre museum in Paris. The body was laced with religious symbols written with the victims own blood while positioned in a very peculiar way. Langdon gose further deep into the mystery when he is led by Sophie Neveu (Audrey Tatou) away from the murder site whilst solving a series of cryptic clues left by the dead curator for them to solve. This series of clues leads them to a series of objects and artifacts that eventually lead them to a secret treasure; a truth suppressed for thousands of years by the Catholic Church regarding the divinity of Christ. First of all, I dont know what the critic were thinking when I first saw the results of the reviews on this movie. As of this writing, rottentomatoes.com has Da Vinci Code at 19% Rotten. I dont know what movie they've been watching or what was in the popcorn. The movie rocked! 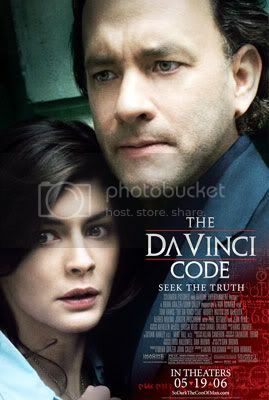 The Da Vinci Code movie was probably the closest book adaptation I have seen to date. Some changes were made also, which is very understandable since certain elements of the book would indeed drag the movie into a complicated mess of deliberation and intricate discussion. Ron Howard has extracted an engaging story out of this book and obviously did as much as he can to bring to life the images and events described in the book. Loyalty to the source material was definitely bhis highest priority. From Audrey Tatou's looks as Sophie to Paul Bettany as Silas, one can definitely say that they were definitive images of what we first thought them to look like when we first read the novel. Most importantly, Howard, master filmmaker in action, didn't lose his style as well. The graphic representations of the code solving mind processes of Langdon are reminiscent to the effects we first saw in A Beautiful Mind where you see the characters light up and stand out in different patterns. Much of the dialogue is very reference heavy and In my opinion, one who has read the book would be able to breeze through the plot very easily. However, if you haven't read the book, you might have to pay very, very close attention. It also pays to have a little background on the subtopics such as the Opus Dei, The Priory of Sion and the Gnostic gospels. Well, that's what the Discovery Channel and National Geographic is for, right? All in all. fans of the Davinci Code book should be satisfied with the outcome. I, personally, am very happy about it. i, on the other hand, was totally disappointed with this adaptation. for me, it never had the adrenaline rush that the book provided. something was terribly off. sayang. Steve Carell in "Evan Almighty"
Some Superman Footage To Knock Your Socks Off. Album Preview: Pearl Jam, "Pearl Jam"
Some Really Neat Movie Monologues.